Make your clothes or other textiles shine with the brilliant colors of Marabu Textil fabric painting and printing color and design your very own textile highlights. The water-based multi-purpose fabric painting and printing colour for light-coloured fabrics is ideal for school, craft, leisure and artisan use. After fixing Marabu Textil can be washed in the washing machine up to 60 °C. The colours are very light-fast, can be mixed and also diluted with water. Marabu Textil provides very good coverage on light-coloured fabrics. We recommend Marabu Textil plus for dark fabrics. Marabu Textil is suitable for all cotton, linen, jute, silk and mixed fabrics with max. 20 % man-made fibres without finishes, but not for knit fabrics. Marabu Textil is easy to apply and particularly soft to the touch. 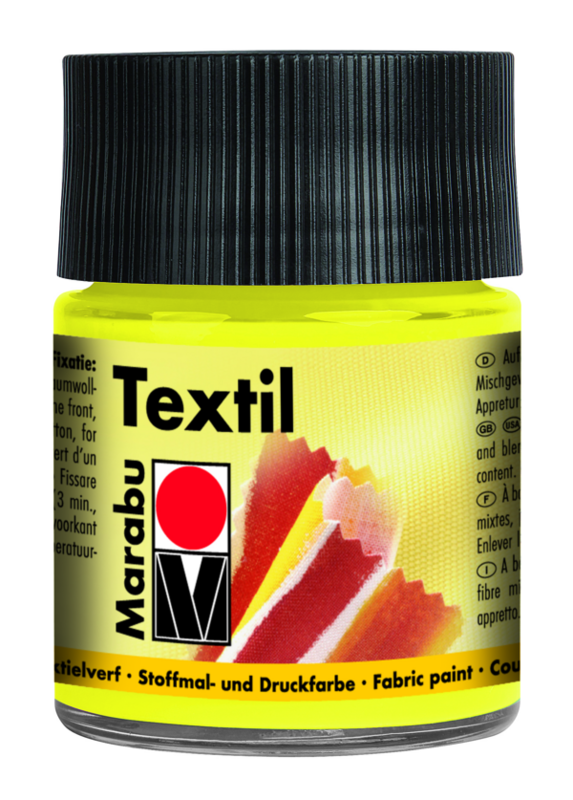 Marabu Textil can be combined with the special effect textile paints Marabu Textil Glitter and Marabu Textil Metallic as well as with the Glitter, Metallic and 3D Liners.